Photo: Girls from our girls home stand happily in front of the almost-complete high school construction. 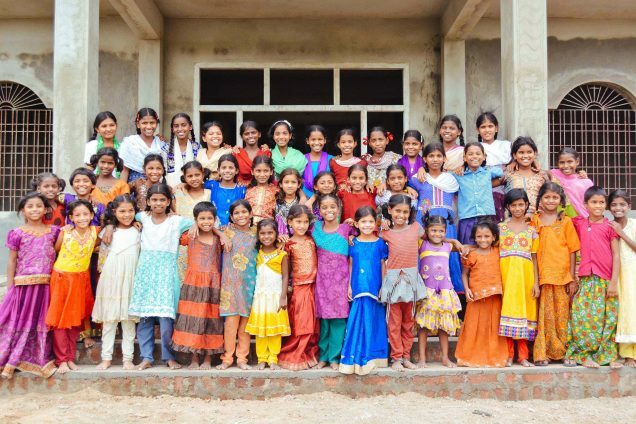 We are happy to report that we recently rescued 42 orphan children from hazardous child labor situations and the trauma of child marriages, through the help of a government agency that is working to protect children in India. This puts our enrollment at the Girls Home and Boys Home at full capacity with 67 girls and 46 boys. All 113 children are enrolled for the new school year, which began in India on June 20th. The children are enjoying the blessing of a good education, studying their native Telugu and Hindi languages, English, math, science, social studies, and physical education, taught by our 13 faithful teachers. With your support we hope to further meet the children’s needs by purchasing some new bunk beds, mattresses, lockers, school supplies, school uniforms, tables and chairs, file cabinets, and library books. In other good news, we increased our campus security system to protect all of our new children. We installed iron grills on the windows and doors, hired 2 new security personnel who monitor the area day and night, and increased our staff who care deeply for our children in everything they do. We are also receiving guidance from government officials and doctors in matters of the children’s nutritional needs, and taking their advice to further ensure the health and well-being of each child. We recently learned that the wall around our campus is not high enough according to government standards, so the Child Department authorities asked us to increase the height of the wall by 3.5 feet. With your support we hope to begin construction on the security wall improvements soon. 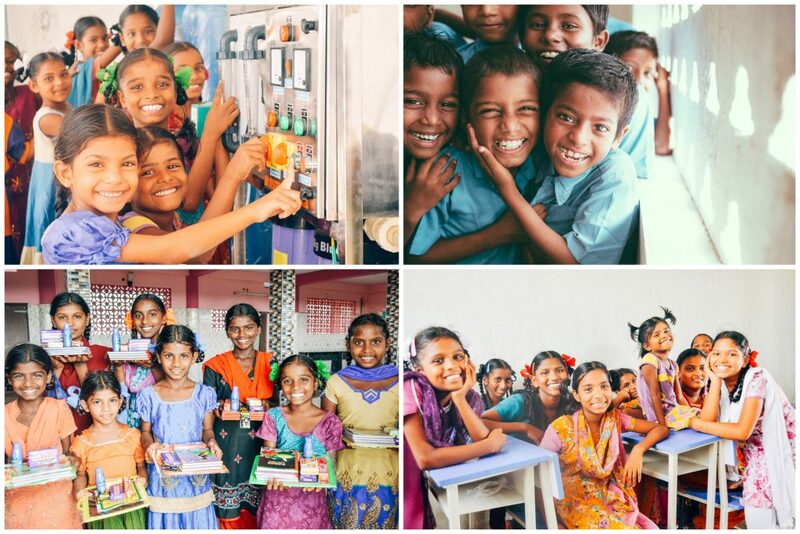 Photo inset: (Top-left): The children are excited about a newly installed reverse-osmosis water filtration system that provides purified drinking water for the entire campus. (Top-right): Boys from our boys home take a break in the classroom to enjoy some time with the photographer. (Bottom-left): Girls are happy about new school supplies and hygiene supplies received at the start of the new school year. (Bottom-right): All are thankful for brand-new desks in the classrooms. In other good news, construction of the new building for our on-campus high school at our main campus is almost complete, just in time for the new school year. However, we are still facing some challenges with getting the high school fully accredited because there is not adequate land space to allocate a sports activity field and playground. With your support we hope to purchase an acre of land adjacent to our main campus where we want to build a new play space for the children — we had to dismantle the existing play area in order to construct the high school facility. Purchasing the adjacent land and building a new playground is also important because we need proof of a children’s sports field and playground in order to maintain our status as an accredited elementary school with the educational department as well. We are happy to report that we have already met the other requirements for our high school’s full accreditation: we purchased a school bus in August 2015, and we have all of the required facilities such as classrooms, a lab room, a computer room, and an office. We decided to start a high school on our campus because our children previously had to travel very far to attend higher classes, sometimes the girls struggle with social problems, and our children are treated carelessly because they come from families below the standard poverty line — they are of the lower castes and Dalits (outside of the caste system, “untouchables”). Often times culturally, they are considered to be the lowest people in the society, so we want to encourage them, love them, and display their talents to the society, as well as give them sufficient care and protection. There is no high school in this area, so we also plan to offer our high school to the public — not just our orphans living on campus. We hope that the tuition paid by outside students will help generate more funding for our orphan care program, bringing us closer to our goal of 100% sustainability.